Neoprene socks + a thin polypropylene sock underneath. Try toe warmers! Available at REI as well as many bike shops. I was having similar issues. I have found the following works well for me in weather in the 30s: Thick wool socks (I use wool hiking socks), cycling shoes, Pearlizumi Amfib booties (a bit thicker and warmer). If the temps drop into the 20s, I may add my Pearlizumi toe booties underneath the full booties. However, after about an hour and 45 minutes my feet get cold no matter what I am wearing. I tend to ride cheapo or flat pedals and will wear sneakers down to around 35F, but when it's really cold, say below 15F, then I want Sorel type boots or mouse boots. I can go for an hour below 5F or so, but then it gets tough. In between, some other variation, maybe work boots. Perhaps I should say I could go, because it's been a while since I've been nutty enough. My friend recently solved his cold feet problem inadvertantly throught the wonders of pharmaceuticals... He has some old, minor foot frostbite from years of winter hiking. Those spots bother him, swell and get irritated in the winter. This year one toe became infected so a visit to the MD was necessitated. Beside an antibiotic, he got an "alpha blocker" (brand name of Cardura) that dilates the peripheral vessels and allows blood to circualate and work it's healing powers. Within a day his foot was almost normal and the side benefit was that he now has toasty warm feet when he rides! The drug can cause some lower blood pressure so we bought a BP cuff at CVS to keep on eye on it. After years of freezing feet with booties and multiple socks, I switched to a cycling boot. It works like a charm. I don't even wear wool socks. Mine are Lakes with road cleats. My only grief with them is that they let water trickle in during the rain--I just waterproofed them; so, hopefully that's fixed. And this typically comprehensive response from John Allen (see bikexprt.com). I wear two pairs of wool socks. That suffices in all but the coldest weather. Chemical foot warmers are available, and work for three or four hours. You break a packet inside to start the chemical reaction, and put them inside your shoes. Bruce Ingle, I think, gave me a pair on one particularly cold day, his annual birthday ride. I think he bought them at Home Depot. The late Sheldon Brown rode the 2004 New Year's Day ride in Shimano SPD sandals -- see this page -- and surprised me with his observation that a major cause of cold feet is constriction of the feet by the shoes, cutting off blood circulation. Sandals don't constrict the feet, and so, counter-intuitively, are much warmer than you would expect. I bought a pair and have had warm feet on days when ice was forming in puddles in the road. (with two pairs of wool socks). You don't want to get the socks wet, but then wetness isn't usually a problem if the temperature is much below freezing. I'd suspect that two pairs of wool socks inside Gore-Tex or other breathable but windproof booties inside sandals would be good to even lower temperatures. Aha, now I know what to do with those booties that have been sitting around in my closet, unused because I would have to cut holes in them for the cleats. The Shimano sandals don't have any materials that soak up water, so they also are good in a warm rain -- wear them without socks and let your feet get wet. Carry socks with you and when you go inside, shake water off the sandals, put on the socks and put the sandals back on. If not wearing sandals, have a pair of bike shoes a half-size larger than usual, to accommodate the two pairs of socks without constricting your feet. For really messy conditions, some people go to work boots and flat pedals. Keeping your legs warm also helps keep the feet warm. I also pull the socks up over my trouser cuffs, if wearing street clothes -- better than any ankle bands to keep the cuffs clear of the bike, and also keeps cold air from getting iside the trouser legs. Today I wore a thick pair of corduroy trousers, and long johns underneath, for the 9 miles each way to and from an appointment. I was comfortable. Thanks to everyone who replied! I'll post my results here, and to the CRW List. I was hoping to do a good ride on New Year's Day tomorrow, but with upwards of 8 inches of snow and single-digit temps expected, that's not gonna happen. Instead, I'm going to go for a snow shoe jaunt - I just need to figure out where to go. If I'm ambitious, it'll be Great Brook Farm State Park (with lots of dedicated trails for XC skiing and - I assume - shoeing), if not, I'll hit Menotomy Rocks park. I know that the Fells has tons of trails, but I'm not that keen on it for some reason. In the meantime, I've discovered that my ICEBIKE project has been stalled because the studded tires I bought from Peter White Cycles are 650b size, not 26-in! A bit of a shock, especially considering what I paid for them. They've got a good rep, though, and shouldn't have any problem with an exchange. Kim and the girls are off to sunny Florida next week, and (unlike the last time they went away) I vow to refrain entirely from car use, come what may! Andrew, Gemma, & Elsa in a new book! British blogger and journalist Carlton Reid has published a 50-page online sampler for his Bike to Work Book. Looks like a wonderful work so far - it will ultimately be available free online as well as in a bound format from Amazon. The work in progress is looking great - especially page 39, where a nice pic of me and the girls is featured! 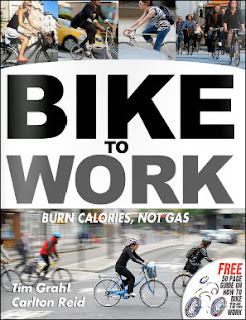 See ebook here: http://tinyurl.com/Bike2Work . I think I managed to burn off at least a few of my Thanksgiving calories on my ride yesterday. I set off around 7 under overcast skies and mid-20s temp to do the Pocket Maps Sherman's Bridge Ride. Same areas as usual... Lexington, Bedford, Sudbury, etc. The title of the ride refers to a plank bridge over the Sudbury River in Wayland. Despite the often-familiar territory, the extra little loop around Sudbury & Wayland turned out to be a real gem, with beautiful conservation land and very quiet roads. The route is 32 miles, which makes an even 50 when added to my 18-mile round trip to the starting point at the Bedford end of the Minuteman trail. My toes managed to stay a little warmer today owing to my fleece socks, but they were still pretty chilly by the end of the ride, and my water froze again... I must figure out a solution to that one!